Babies sleep a lot. What do they dream? Mother of newborn Mila uses photographic images of her baby sleeping to imagine the world her daughter visits while sleeping. Fabric, toys and items are arranged to create fantasy worlds. Phraseology and images are somewhat repetitive although the repetition is one element that makes the book more fun for children who can get into the rhythm of the book while also seeing the variations. 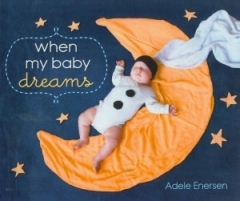 While this book is Adele Enersen's personal creative journey and the story features her own daughter as the central character, thus giving a tone of intimacy and specificity, the story and photographs are universal enough to be enjoyed by other parents and their children. A widely popular blog now is finally in a more permanent book form to be kept, shared and treasured for years to come. WHEN MY BABY DREAMS is a book for both children and adults to share. It would also make a wonderful gift to parents of newborns. WHEN MY BABY DREAMS would make a wonderful Valentine's gift to your baby to keep for the future to share years later. Fun and creative, one mother's photographic journal inspires the imagination. Delightfully original and offbeat.